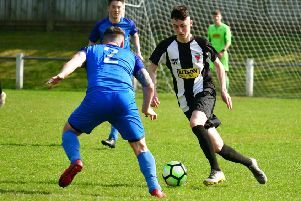 Shilbottle only just kept their Division Two title chase on track as they edged out Alnwick Town Reserves in a nine-goal derby thriller, with Josh Hay scoring his fourth in four weeks for the Colliers. Meanwhile, relegated Wooler suffered a slender defeat, 1-0 at Wallsend Boys’ Club in Division One. Wallington lost their Premier Division clash at home to Whitley Bay A.
Connor Andrews and Josh Miller netted late goals at Shankhouse as Champions Blyth Town came from behind to take the points. Joel Arnold’s first-half strike had put the hosts in front. Killingworth Station were also leading against Carlisle City until late on through Paul Dunn’s strike, but Marc Shiel netted a last-gasp leveller. Whitley Bay A won at Wallington with second-half efforts from Dillon Blake, David Hall and an own-goal. Liam Anderson netted a consolation. Northbank had Ricky Lee James (two), Lewis Matthews and Nicky Routledge on the scoresheet in their success at Rutherford. Dean McCallum and Taylor Brown replied for the hosts late on. Micky Haley’s strike mid-way through the second half ensured that Champions Percy Main ended their season on a high with a victory at New Fordley. Second-placed Birtley Saint Joseph’s raced into a three-goal lead against Hexham with goals from Dan Irving, Tony Smith and Ryan Moore but the Tynedalers stunned them after the break as goals from Curtis Harvey (two) and David Hall drew the game level. Irving grabbed his second with five minutes to go to win it. John Bone’s hat-trick for AFC Newbiggin at Blyth Isabella was added to by Brent Aisbitt, with a double, and Michael Hogg while Wallsend Boys’ Club’s Liam Stubbs hit the only goal in their slender success against relegated Wooler. Wayne Dunn bagged a brace in Ponteland United’s victory at Newcastle Uni, while goals from Andrew McClay and Alan O’Donnell saw Cullercoats take three points against Bohemians. The game between Cramlington Town and Bedlington Terriers Reserves ended in a goalless stalemate. James Fenwick hit a double as Gateshead Leam Rangers kept their noses out in front at the top of the table. Ronnie Short got on the scoresheet for hosts Newcastle Benfield Reserves. Josh Hay’s hat-trick for Shilbottle CW was his fourth in four weeks as they just edged out local rivals Alnwick Town Reserves in a nine-goal thriller. Ross Gair and Liam Brooks got the Colliers’ others with Neil McFall, Jon Colley, Kenny Collins and Scott McMullen on target at the other end. John Wyres, John Ransome and Phil Doolan were Wallsend Labour Club’s scorers in their win over Wideopen and Robert Jefferson, Steve Matthew, Michael Rankin and Andy Davidson crashed home from Grainger Park against Willington Quay Saints, who pulled one back through Kyle Austin. Shots from Liam Shaley, Liam Mulligan and an own-goal gave Lindisfarne Custom Planet that points at West Allotment Celtic A, who hit back with goals from Dan Surley and Ben Jackson while neither side could break the deadlock between Seaton Burn and Whitburn Athletic. Newcastle Building Society Premier Division: Killingworth Station 1 Carlisle City 1, Gateshead Rutherford AFC 2 Northbank Carlisle 4, Wallington 1 Whitley Bay A 3, Shankhouse FC 1 Blyth Town 2. Nike Division One: Birtley St Joseph’s FC 4 Hexham 3, Blyth Isabella 0 AFC Newbiggin 6, Cramlington Town 0 Bedlington Terriers Reserves 0, Cullercoats 2 Gosforth Bohemians 0, New Fordley 0 Percy Main Amateurs 1, Newcastle University 0 Ponteland United 2, Wallsend Boys Club 1 Wooler 0. Bay Plastics Division Two: Grainger Park Boys Club 4 Willington Quay Saints 1, Wallsend Labour Club 3 Wideopen And District 0, Newcastle Benfield Reserves 1 Gateshead Leam Rangers 2, Seaton Burn 0 Whitburn Athletic 0, Shilbottle C W 5 Alnwick Town Reserves 4, West Allotment Celtic A 2 Lindisfarne Custom Planet 3.